Listen to our interview with Portland Talk 620AM - thank you again for having us on the show! We've heard a lot of noise lately around department stores making such a big deal out of the holiday shopping season, and some recent news has come out asking people "When is it too early?" Nordstrom even gained attention for NOT decking their halls pre-Thanksgiving stating that they "like the idea of celebrating one holiday at a time" - you have to appreciate that. We'll keep an eye on them to see if they stick to their word or give in to the competition. Being that we here at UglyChristmasSweaterParty.com only focus on one thing... Ugly Christmas Sweaters ...we hope you give us a pass for getting out of the gate early. Of course, if you visited our website in search of fine China, perfume or 3,000 count Egyptian cotton bedding - well, we can't be blamed for bombarding you with a holiday themed sales environment, right? So what do you think? When is it too early? Team Ugly invites you (yes, we mean you) to attend our book release and signing party this Friday, November 18, 2011 at The Indiana Welcome Center. We are thrilled to meet you all and sign copies of our recently released (and soon to be famous) book "Ugly Christmas Sweater Party Book: The Definitive Guide to Getting Your Ugly On" (Abrams Image, 2011). The event will be extra special as it will take place along side the annual A Christmas Story Comes Home event, featuring the film scenes from "A Christmas Story", which is very cool. And if that's not fun enough, you and the kids can slide down Santa's Mountain - just like Ralphie did after he asked for a Red Ryder carbine-action, two hundred shot Range Model air rifle with a compass in the stock and a thing which tells time. Bring the kids. Or don't. Bring a copy of our book. Or don't...we'll have some there available for purchase. Wear an Ugly Christmas Sweater. Or don't...but you won't be as cool as everyone else. We look forward to seeing you there! 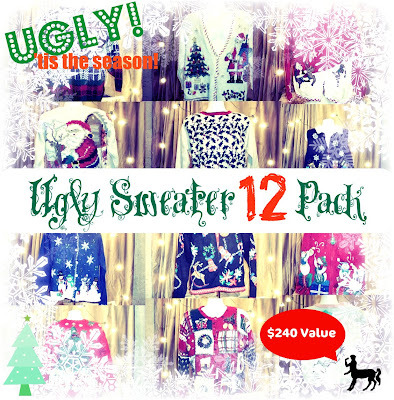 Team Ugly is proud to present, the "Ugly Sweater 12 Pack". Don't just go to an Ugly Christmas Sweater Party...BE THE PARTY! Random Party while waiting in line at Starbucks? Done. Just picture how awesome you will be showing up with the Ugly Sweater 12 Pack. Did we tell you that you can customize what sizes you want? How will you feel when a Ugly Sweater 12 Pack arrives at your door? Answer: Pretty awesome. We're excited to announce that we'll be giving away one Ugly Christmas Sweater everyday this month! We invite you all to "Fan" us on Facebook and enter the "Name It to Win It" contest by commenting your most creative and funny name for the Ugly Xmas Sweater that we post. Get started now! Good luck! Along with our good friends at the Zombie Club, we're holding an Ugly Christmas Sweater Party & Fundraiser this Saturday night! If you're in the Chicagoland - Northwest Indiana area, please join us for a good time and express your UGLY! You can now Fan us on Facebook and/or Follow us on Twitter...be sure to join in on all the fun, as we would love for you to upload photos of you and your family and friends sporting your ugly goods from UglyChristmasSweaterParty.com! Thanks for helping kick off the season with a great start! We can't wait to hear from you soon! Team Ugly believes that tradition is what makes the holiday season the best time of year, and we think one of the best traditions is watching our favorite holiday movie. By the way, what are your favorite holiday movies? I am from Northwest Indiana, which is where the movie takes place, and just like Ralphie yearned for a red rider BB gun with a compass in the stock and a thing that tells time, I yearned for a Bears pullover Starter jacket. As we all know - Ralphie got his gun, but I never got my Bears jacket :( . Then again, I avoided shooting my eye out, so we're even. Adam's pick:"Rudolph the Red Nosed Reindeer"
Rudolph is an inspiring tale that lets everybody know that no matter how many times you get left out or get made fun of, you can still end up being awesome. While "Die Hard" is not your traditional Christmas movie, I'd like to point out that if it wasn't for Christmas officer John McClain would not have been at Nakatomi Plaza on that fateful night. Also, there is something about watching Bruce Willis shoot bad guys in the face and blowing stuff up that makes standing in the long lines at the mall much easier. There you have it folks, these are our favorite holiday movies, let us know what yours are! The first batch of 2009 Ugly Christmas Sweaters are in! Be sure to check back often and tell your pals. Last season the Ugly Christmas Sweater Party website enjoyed huge growth, as media outlets like CNN, MSNBC and newspaper websites across the county covered this slightly new and very popular holiday tradition. My goal over the next few months is to travel near and far to gather up a fresh batch of Ugly Christmas Sweaters; featuring the most awful designs, patterns, actual Christmas tree lights that light up, etc. If you happen to still have your ugly sweater from this past holiday season and you'd like to advertise it on my site, please feel free to contact me, using the links below.